Thx for the claim add. Also for this thread, its fun! Were you joking or are you referring to Spike when he was human? Right now I'm considering them more or less the same character, but that may change. 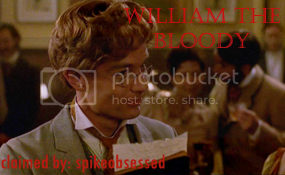 Well, Spike was casually called William the Bloody when he was human, so I'll put you down for him. Could I be the chair... in the Dollhouse? I'm gonna wipe you so clean that you're gonna feel dirty! Wait, are we allowed to be inanimate objects? Because I so pick the Slayer's Scythe if we can. Blurg! I just edited my post to respond to your edit! Anyway. The scythe doesn't have a personality and isn't self aware so I don't really think it could be considered a character. I edited my edited post to respond to your post before you edited it... I think that's how it went. Sorry. I feel bad, but I don't know what to say, it's not a character. You can always claim someone else or, I dunno, start a "Claim An Inanimate Object" thread. That's a good one. I love Betta George. I claim Darla as a Human! Also, I decided to change my claim from Anya to Topher. I love Anya, but I think I love Topher more... Anyway she is now available to claim if anybody else wants her. He's not my FAVOURITE character, but still: I claim D'Hoffryn. I love the idea of revenge, erm, justice demons. Hehe, I'm calling myself keeper of d'hoffryn now. Erm ... Was that the idea of claiming a character? Can I claim Adelle? I love her so.